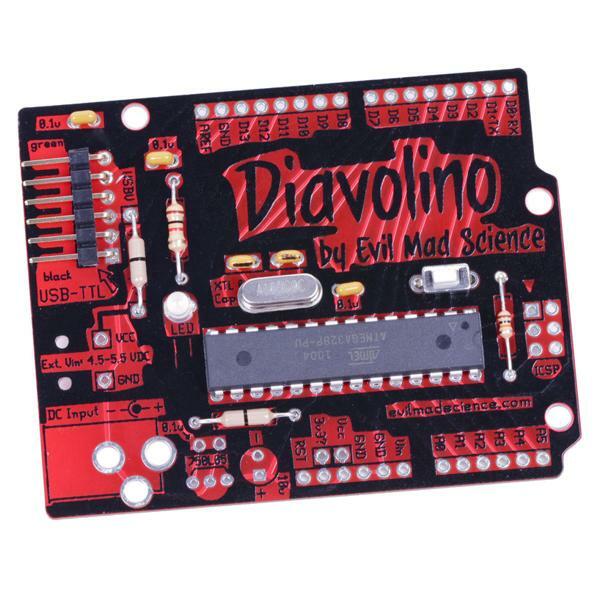 The Diavolino Kit from Evil Mad Science is an easy to build Arduino compatible microcontroller that you solder together yourself. 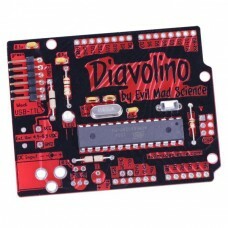 Diavolino translates to "little devil" in English and features a cool red and black circuit board. Enjoy soldering together your own microcontroller robot brain with the red hot Diavolino kit. This kit uses through-hole parts for easy assembly with basic soldering skills. The ATmega328p microcontroller is pre-programmed with the Arduino bootloader. Since this board doesn't have any super tiny hard to solder parts, you will need an FTDI USB to Serial TTL cable or adapter to load sketches onto the Diavolino. The Diavolino requires 4.5-5.5V and can be run from a battery pack. There are pins for an optional voltage regulator and power jack if you prefer to run from a 9V adaptor. Please note that there is no option to provide regulated 3.3V as with some Arduinos. This bare bones Arduino package does not include any sockets or headers. This board is perfect for DIY Do It Yourselfers that like to solder and want to use the Arduino platform as part of a permanent robot project or have a need to customize the Arduino for their own needs.